Ellie Nieves interviews Miguel deJesus, the Founder and CEO of Purpose & Action on how to think like a CEO. Ellie Nieves interviews attorney Karen Lim who shares about her personal career transition and her journey to career success. Ellie Nieves interviews transformational speaker, facilitator, radio host and bestselling author Charmaine Hammond. Charmaine shares leadership strategies to help you get crystal clear on your goals, map out a plan, navigate obstacles and celebrate your successes. Ellie Nieves interviews Julie Steinberg of the Wall Street Journal on the 9 Rules Women Must Follow to Get Ahead. 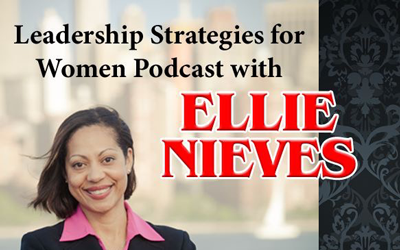 Ellie Nieves interview author and leadership strategist Deborah Stephens on: The Female Leadership Experience: 7 Ways Corporate Cultures Need To Change In Order To Retain Women Leaders. Get Organized and Get Ahead! Ellie Nieves interviews Jennifer Ford Berry, the Best Selling Author of Organize Now! A Week-by-Week Guide to Simplify Your Space and Your Life. Jennifer will share how you can get ahead in your career and personal finances by getting organized. Ellie interviews, low glycemic nurse, Joyce Harrell, on Leadership Strategies for Women Radio. Learn how living a healthy lifestyle can help you live a more productive and successful life.